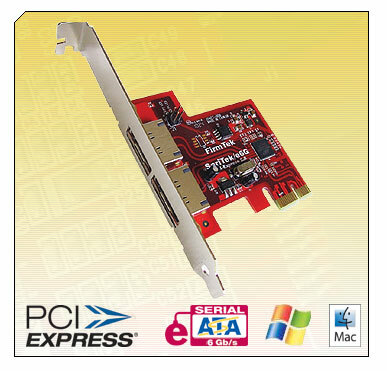 The SeriTek/e6G is compatible with Apple Mac Pro, late 2005 PowerMac G5 (11,2) and PC's with an available PCI-Express slot. Mac OS X 10.6.x (Snow Leopard) 32-bit and 64-bit modes are supported along with Mac OS X 10.5.x, 10.4.11, Windows 7, Vista and Windows XP. The new FirmTek 64-bit SeriTek/e6G driver is built from the ground up to support the latest features provided in Mac OS X Snow Leopard while still maintaining backward compatibility with 32-bit system configurations. SMART Application Support: The FirmTek SeriTek/e6G driver features S.M.A.R.T application support which enables it to deliver SMART data to third party utilities like Hardware Monitor. Users can conveniently monitor hard disk temperatures and the health of hard disks attached to the SeriTek/e6G while using their favorite Macintosh SMART reporting application. In addition, Disk Utility can also be used to verify the SMART status of hard disks connected to the SeriTek/e6G. The FirmTek SeriTek/e6G is the first 2-port eSATA 6G controller that supports both port multiplication and Macintosh 3rd party SMART applications. SMART application support is a very useful feature for monitoring the condition of hard disks connected to the SeriTek/e6G. Performance: The SeriTek/e6G features an energy efficient, two channel, SATA 6Gb/s compliant, hot swap, native eSATA interface with PCI-Express 2.0, one-lane bandwidth. The controller is compliant with the Serial ATA Revision 3.0 specification which supports SATA 6.0 Gb/s, 3.0 Gb/s and 1.5 Gb/s hard disks. SeriTek/e6G performance is optimized when installed in a PCIe 2.0 slot. The SeriTek/e6G is also backward compatible with PCIe 1.0 slots. For maximum performance, FirmTek recommends installing the SeriTek/e6G in a PCIe 2.0 slot when possible. The 2009 Mac Pro (MacPro4,1) offers PCIe 2.0 in all PCIe expansion slots. The 2008 Mac Pro (MacPro3,1) offers PCIe 2.0 in slot 2, while slots 3 and 4 provide PCIe 1.0 bandwidth. The SeriTek/e6G is PCI-Express Base 2.0 specification compliant which allows it to support PCI-e communication speeds of up to 5.0 Gbps when installed in a PCI-Express 2.0 compatible slot. Port Multiplier: The FirmTek SeriTek/e6G supports FIS-based port multiplier aware hardware which allows up to ten hard disks to be connected to the controller when two 5-bay SeriTek/5PM enclosures are available. A port multiplier configuration can provide massive storage volumes for audio/video editing, multimedia libraries or backing up data. The SeriTek/e6G optimizes performance for up to 5 hard disks per data port by utilizing the advanced bandwidth characteristics of the PCI-Express architecture. Port multiplication also delivers significantly less cable clutter. A single eSATA data cable can attach up to five hard disks to the computer. The SeriTek/e6G can dramatically increase on-hand data storage capabilities. With up to 10 hard disks connected simultaneously, accessible storage limits can be effectively eliminated for all but the most demanding applications. Direct Connect: Using a direct connect hard disk enclosure like the FirmTek SeriTek/2EN2 allows up to two external SATA hard disks to be attached to the SeriTek/e6G. This configuration offers optimal bandwidth for high performance RAID installations with a limited number of hard disks. The SeriTek/e6G eSATA controller supports a wide variety of hard disk configuration options for maximum connectivity.